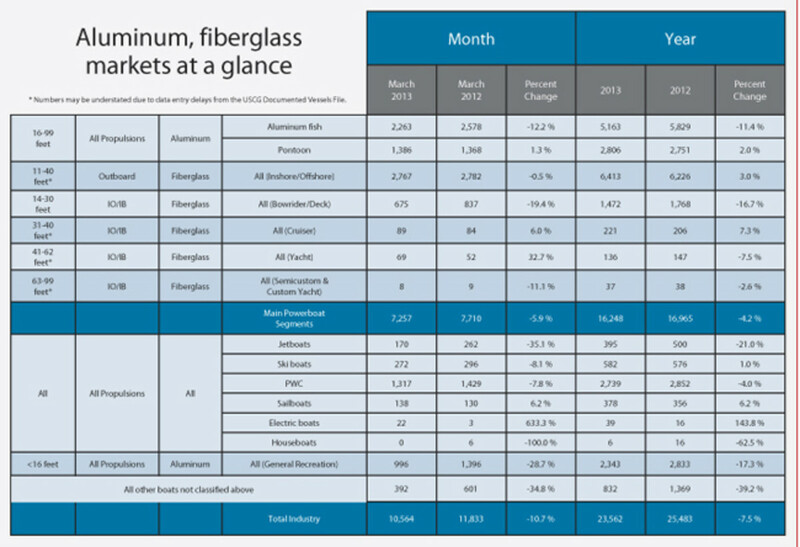 Sales of aluminum pontoon boats rose just 1.3 percent, or 18, to 1,386 from the same month last year in early reporting states and sales of 11- to 40-foot outboard fiberglass boats were virtually flat, dropping by 15, or 0.5 percent, to 2,767, Statistical Surveys Inc. reported. Sales in the industry’s main powerboat segments, which consist of five fiberglass and two aluminum categories, fell 5.9 percent to 7,257 in March and industrywide sales dropped 10.7 percent to 10,564 in 27 states that represent about 63 percent of the U.S. boat market. The smaller-volume categories of larger boats fared better in early-reporting states in March than they have for months. Sales of 31- to 40-foot cruisers rose by five, to 89, sales of 41-to 62-foot yachts climbed by 17 to 69 and the 63- to 99-foot yacht category was nearly flat, down by one boat, to eight.